Bake My Day! : Airy Multi grain breads? Possible! Airy Multi grain breads? Possible! Let's do it! Just write and hit publish. Don't stare at the screen, don't drown in blog reading, tweets, facebook, and most importantly don't get intimidated by other peoples fabulous pics, fabulous postings... Peptalking myself. Bread! I baked bread and even managed to get some pics while they are still untouched. I think the boys here missed my home baked bread, every loaf I turn out disappears. 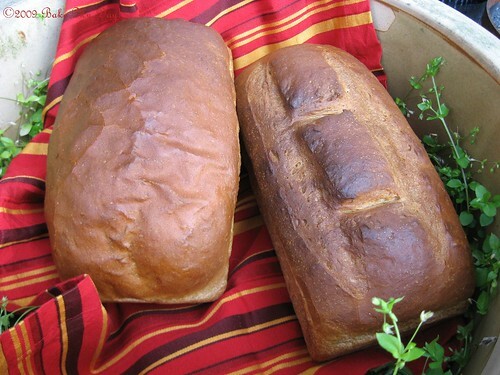 These two loaves are adapted from a pioneer bread, using a slurry made with semolina, a little teff flour (calling all bread baking buddies, any teff flour left? 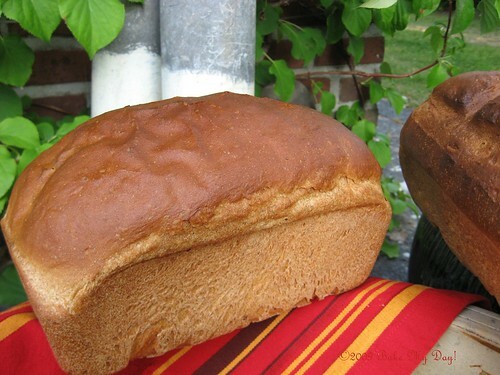 ), whole wheat flour and unbleached bread flour. Straight dough method, starting with a slurry, introducing a little auto-lyse. Combine and stir together in the bowl of your stand mixer. Let cool until luke warm. All ingredients together in a large bowl or the bowl of your stand mixer and mix with a wooden spoon until just combined. Cover with a teatowel and leave to stand for 20 minutes (auto-lyse). Start kneading until you'll get a soft pliable dough that cleans the bowl, just about tacky not sticky. Transfer dough to a large lightly oiled bowl and cover. First proofing (until doubled) will take 1 to 1.1/2 hour. Turn out on a lightly oiled surface, half, and pat each into a large rectangle, fold a business letter and roll up from the smaller side into a loaf shape. Cover and let rise (approx. 45 minutes to 1 hour). Preheat oven to 220. Bake off: 5 minutes on 220, turn oven down to 200 and bake for another 35 minutes until golden and hollow sounding when tapped on the bottom. Pinch the corners, (they should feel firm) to make sure they are done. Teff ... Teff ... Tiff ... flour ... Teff flour oh I think so. Making that injera thingie again with it. See that's why you don't see me on tweets or facebook - what a louse, I sign up and check once a month ... maybe ... bad girl. I like the two mark score job on the right loaf. I thought you spoke directly to me these first few lines...phew, luckily you were just talking to yourself (mmm... is that a good sign?). Tanna's right to stay away from those timeconsuming sites, before I know it I throw away my time with (let's be honest) nothing usefull. Teff, isn't that a coincidence... I have some. Your breads look gorgeous, so high too! Sky high loaves and truer words were never written than the first few lines of the post. Unless you are planning on a career in food photography, what I've seen on your blog is a delight and inspiration...and lets the viewer know how the recipe turned out...sort of the point most of the time, right? No teff flour, but might have to get some these look so delish. WOW, great great loaves. What's teff? Hopefully it's not something complicated. I'd love to make such good looking airy loaves! WOW!! Wow your bread came out really moist (at least it looks that way). I love soft, fluffy bread and this recipe looks like a winner. Thanks for sharing. If you don't mind I'd love to direct Foodista readers to your blog. Just add your choice of widget to this post and you're all set! Great way to use up that leftover teff! The loaves look wonderful, love your scoring! Hmm..let me check the flour pantry to see if I have any teff flour left. Yup! What a great way to use up some flour left overs. Would love a slice of that toasted right about now. It is wonderful that one can get airy, fluffy multigrain breads. Hi...stumbled on our blog. 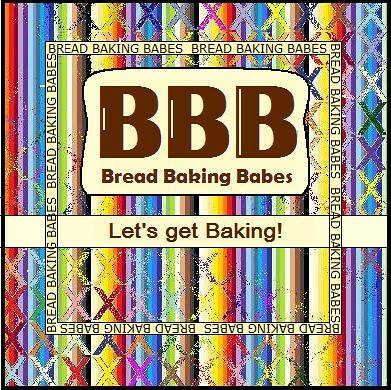 Your breads look yummy. I should try my hand at bread making one day. It's wonderful to find a fellow food blogger in Nederland! Brilliant idea. Yes, I have teff flour left over! And, like you, when I bake bread it disappears. If I buy bread, it lasts a little longer. Pretty loaves. So well risen!! I like your little pep talk to yourself, I'm going to have to keep it in mind! And those loaves, just beautiful!